Today is Tet, the Vietnamese new year, which is the year of the Tiger. It is supposed to be an official national holiday that lasts for three days. In actuality, this celebration can last seven to ten days, as it’s the most important holiday of the year. In southern Vietnam, the celebrations begin before Tet, and in northern Vietnam, they continue after this date. It is common that business and work will be slow in Vietnam around this time of year, as people either go on vacation or are in vacation mode. Tet marks the beginning of the spring season on the lunar calendar. The celebration is also called Hoi xuan, which means Spring Festival. Most people think of it as a refreshing time, to forget the troubles of the last year and make way for the new. A common practice is for people to repay their debts, so that they start the new year without that problem. Shops are closed down during Tet, so during the few days before the holiday, the streets and markets are bustling with commercial action for people to stock up before it is too late. Parents also try to shop for new clothes for their children. Expats living in Vietnam will definitely experience this holiday is some way. 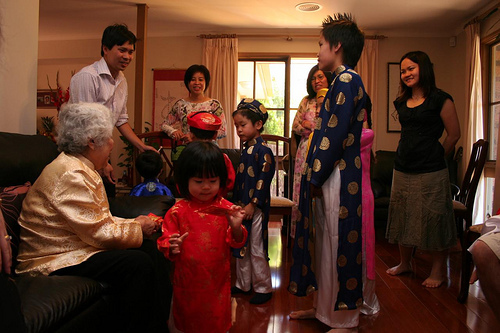 Also, Vietnamese who live in other countries often go back to Vietnam during this time to celebrate Tet with their families. Many people make pilgrimages to religious temples, while others just visit their relatives. People often visit friends’ houses, wish greetings for the new year, and give money to children in red envelopes. Some think of Tet as a time of ancestor worship, and they go visit their dead relatives’ graves and altars. A very common Tet tradition is for people to clean their houses and prepare traditional and/or vegetarian foods. People often take turns in the kitchen, as the food is a very long preparation process. Some traditional foods include Cu Kieu (pickled leeks), Hat Dura (roasted watermelon seeds), and Dura Hanh (pickled onion and cabbage). A traditional dish is Banh chung, which is sticky rice and beans or meat wrapped in Dong leaves. There are also traditional domestic decorations found during Tet, such as a bamboo new year tree and bonsai trees. Tet is a very superstitious holiday, and there is a whole list of rules on what will entail good or bad luck. For good luck, people buy a lot of water and sprinkle lime powder around the house. People often go out gambling afterward to test their luck.